Easiest dinner ever! 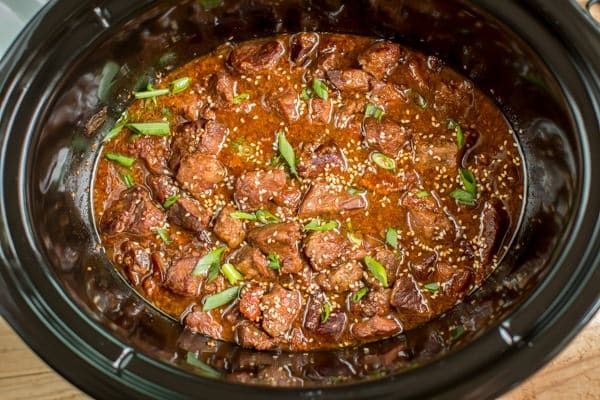 Slow cooker teriyaki beef takes just minutes to add to the slow cooker. I’m all about easy dinners – especially ones that I can prepare ahead for those busy nights I don’t always see coming. 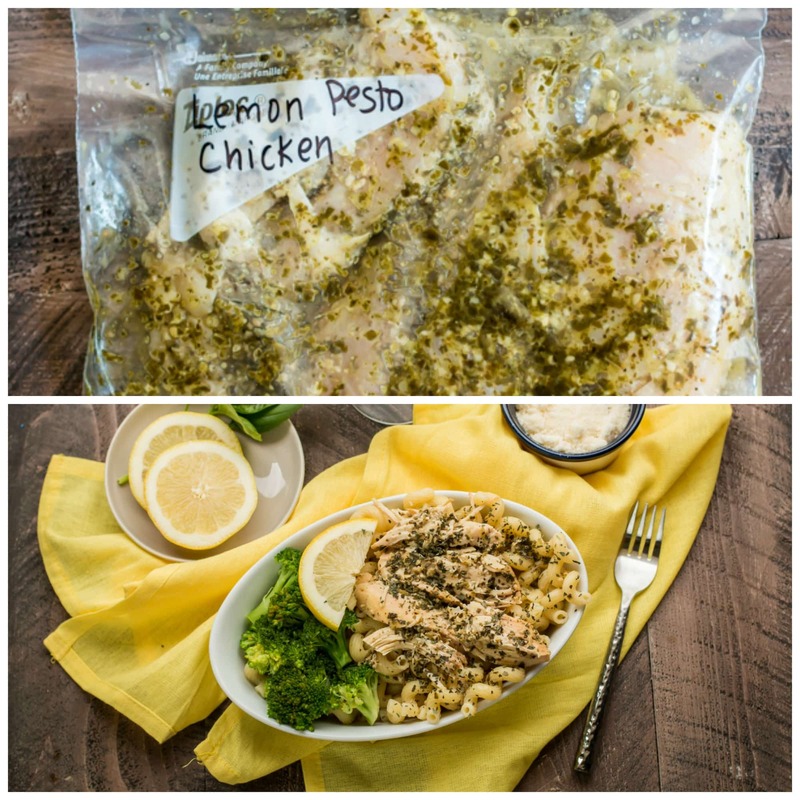 That’s why I’m a big fan of freezer meals – meals that are prepared ahead of time but frozen before they get cooked. I like to keep my freezer stocked with a few different ones. 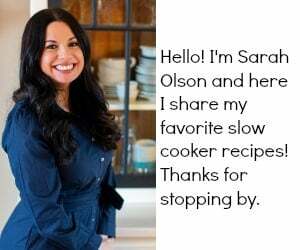 I can usually spend one afternoon preparing a few different recipes and have the freezer stocked for a few weeks with delicious, healthy meals. 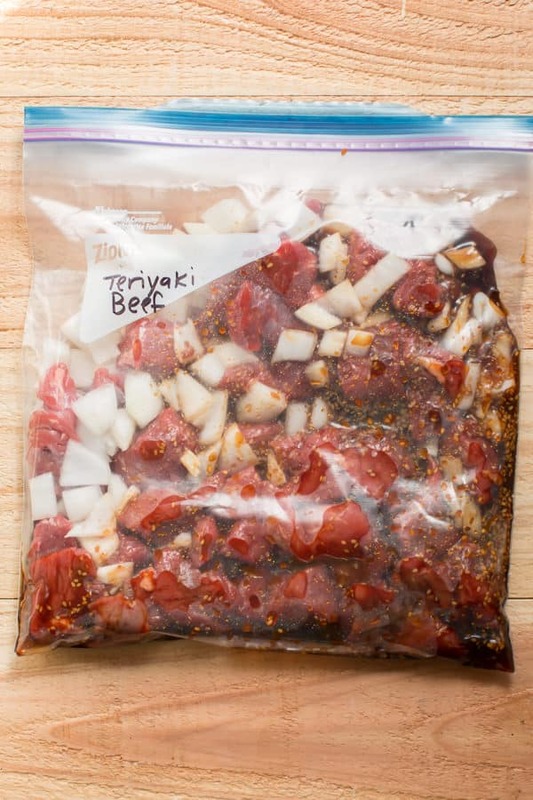 My latest freezer meal is this Easy Teriyaki Beef. 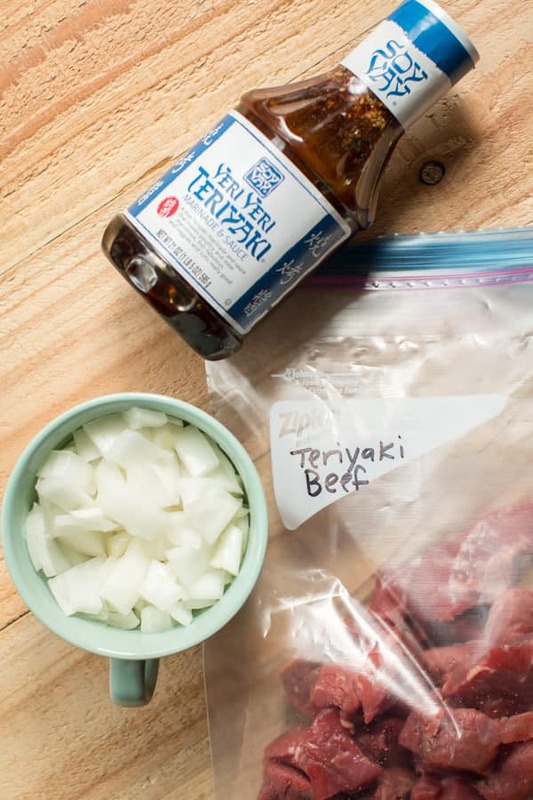 There’s only 3 ingredients – Soy Vay Teriyaki, beef, and onion. 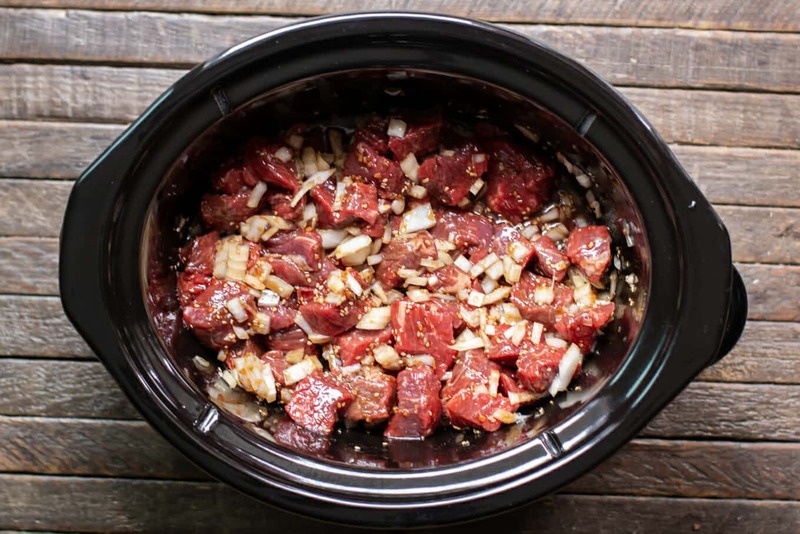 The preparation is so easy as well – just cut the beef into pieces (or buy pre-cut) and chop the onion before putting all three ingredients in a Ziploc freezer bag and putting it in the freezer. I like to prepare enough for two or three meals at a time so I know I always have a meal ready to go. Then, all I need to do is put it in the slow cooker for dinner. It’s a cinch to get on the table over steaming rice! I like to serve it with some extra veggies on the side but it’s delicious on its own over rice. 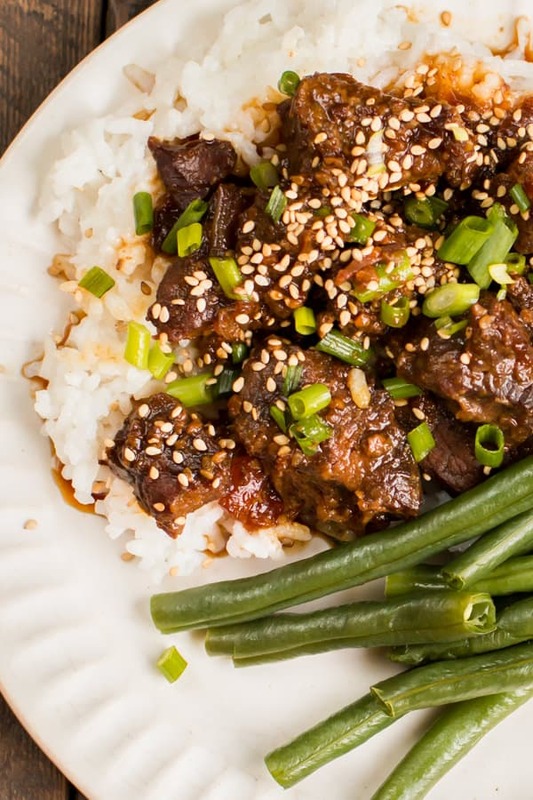 This easy teriyaki beef is a great alternative to takeout. With only three ingredients, I know exactly what’s in it and don’t have to worry about the (unnecessary) ingredients added to most takeout dishes and since I use the slow cooker, there’s no frying required. 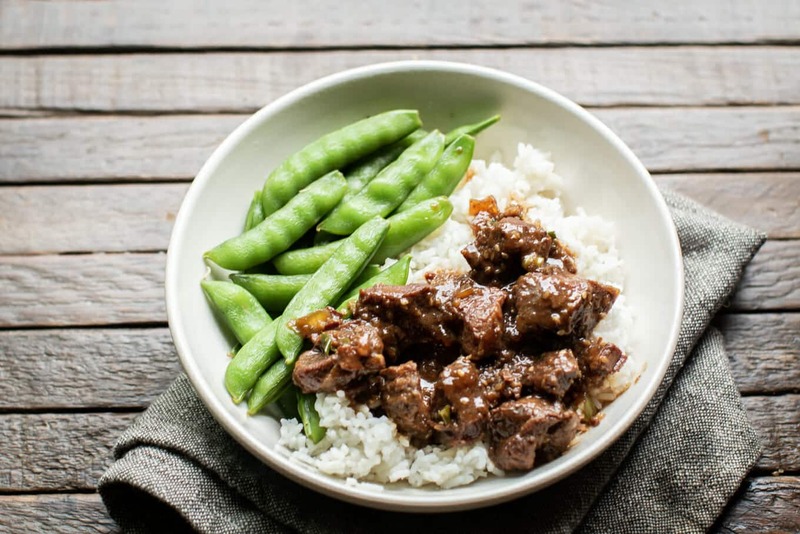 The Soy Vay Teriyaki gives it the delicious takeout flavor and since the meat and onions are prepared and cooked with the teriyaki sauce, that flavor is in every bite. 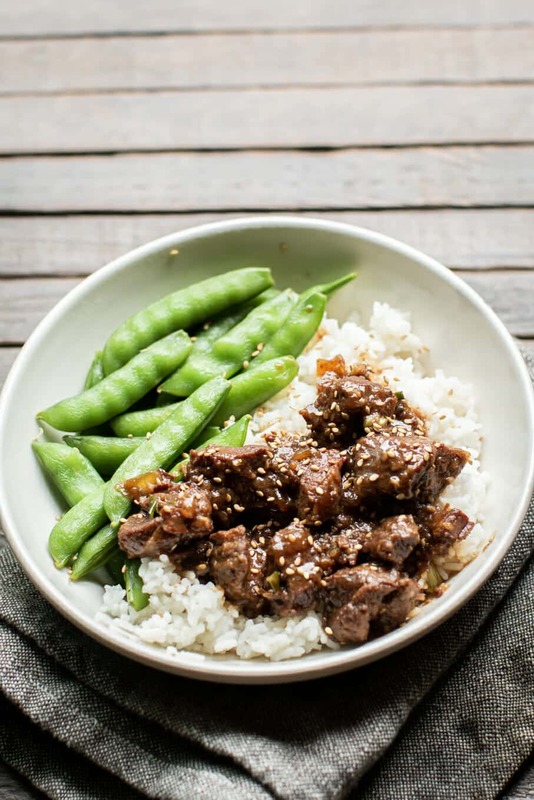 Plus, by the time you order and wait for delivery or go out to pick up the takeout, preparing the Easy Teriyaki Beef takes the same amount of time. So you get to save money, save time, AND eat healthy. Add everything to a gallon sized freezer bag. Squeeze out excess air. Freeze for up to a month. 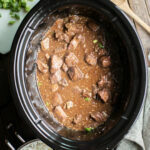 Thaw in fridge before cooking in slow cooker. Follow next instructions to cook. Nutritional values are approximate. If you require a special diet, please use your own calculations. Values below are for 1/6 of the recipe. 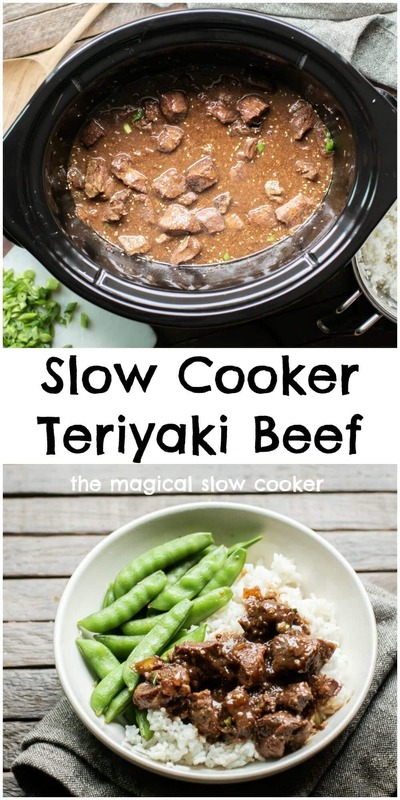 I can’t wait to make this easy slow cooker teriyaki beef! It looks so great. i might add a little fresh ginger to it just for fun. 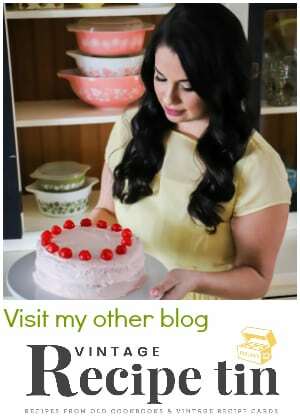 Sarah – is that sesame seeds sprinkled on top? Yes, I used jarred toasted sesame seeds. I will add that to the recipe. Thank you! I have another question – have you ever tried this with chicken? 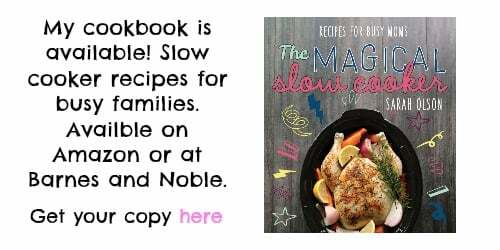 When doubling the ingredients what do you set the slow cooker at? I would do the same as the recipe says, should do fine. 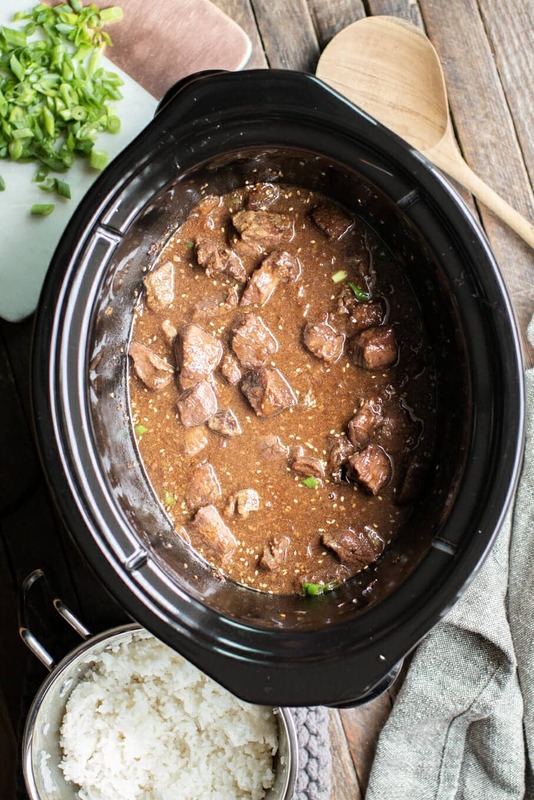 For your already prepared freezer meals, do you throw everything in the slow cooker “from frozen”? Or do you thaw it out first? Can’t wait to try this!! Thank you! I always thaw first. Some times it’s still a little frosty. Hi Shannon, you would have to do your own test on it. I am unsure if that teriyaki sauce is thick and sugary, there may be a little bit of burning on the edges. Do you add any water? Or stock? 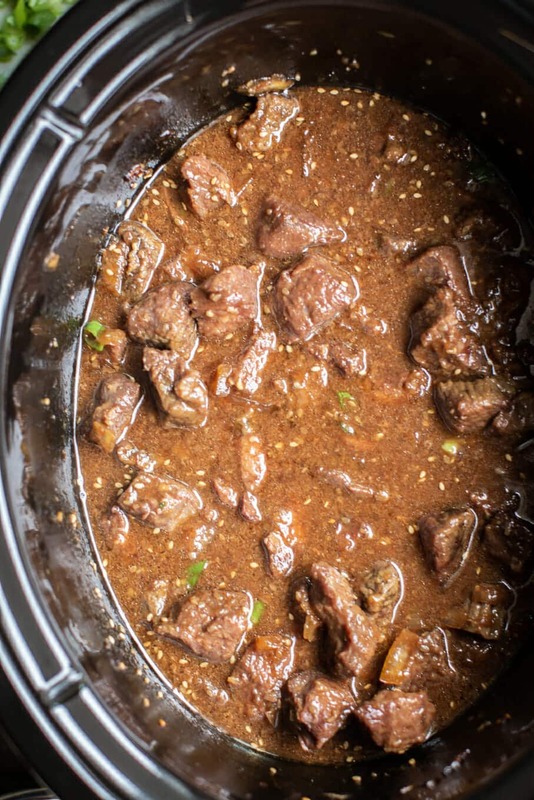 Should the teriyaki sauce cover the beef? No, the beef will create more juices while it cooks. Can I add frozen steamed broccoli to the crook pot or do I have to heat it up in the microwave? Hi Cristina, you can but for prettier presentation I’d steam it in the microwave. Broccoli turns an ugly color in the slow cooker. 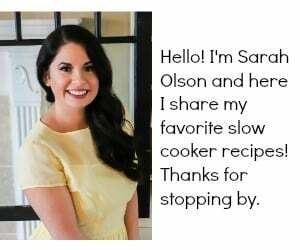 Hi Sarah, could I add a little cornstarch to thicken sauce? Yes! It won’t need much. Can I cook this low for 6-8 hours? Where do you find the teriyaki sauce? I think it would be fine, it looks the same right? That was my second choice for this recipe. Hi, could I put green peppers in the crock pot? Yes! that would be really good! If I use only 1lb of beef would I cook it only for 2 hours? Probably 3 if you want it tender. I’ve tried this recipe with beef and it came out really good. Can I use chicken with the same ingredients?